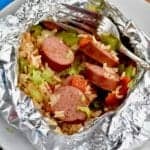 This Jambalaya Foil Packet Dinner Recipe is about 30 minutes start to finish and so delicious! Make it on the grill, make it in the oven, make it over and over! Preheat your oven or grill to 400 degrees. Place five square pieces of foil on the counter and spray the centers with cooking spray. Divide the mixture among them. Fold up two sides of the foil and fold over. Then curl both ends in to make a seal packet. Place directly on the grill, or on a baking sheet in the oven. If grilling, turn over half way through grilling. Cook for 20 to 25 minutes or until the rice is soft.